A meteorite is a natural object originating from outer space that survives an impact with the Earth’s surface. While in space it is called a meteoroid. When it enters the atmosphere, air resistance causes the body to heat up and emit light, thus forming a reball, also known as a meteor or shooting star. The term bolide refers to either an extraterrestrial body that collides with the Earth, or to an exceptionally bright, reball-like meteor regardless of whether it ultimately impacts the surface. Generally, a meteorite on the surface of any celestial body is a natural object that has come from elsewhere in space. Meteorites have been found on the Moon and Mars. Meteorites have traditionally been divided into three broad categories: stony meteorites are rocks, mainly composed of silicate minerals; iron meteorites are largely composed of metallic iron-nickel; and, stony-iron meteorites contain large amounts of both metallic and rocky material. Meteorite is regarded as the embodiment of strength. Meteorite is often associated with supreme power, bravery nobleness which can help You can find dozens of celebrities with the Sun in Capricorn Ascendant in combination on Astrotheme, listed in popularity order and based on our visitors’ clicks. fighting back ghosts and darkness. 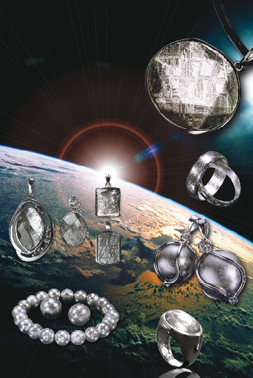 It is believe that wearing Meteorite items can promote body Qi and blood circulation. It can also enhance vitality and energy which benets one’s physical strength and resistance against diseases. Couple’s intimacy will be enhanced as well. Due to its origin from the outer space, people believe that Meteorite can help them communicate with God. It can be used as a powerful medium for praying and making wishes.